Northpoint, also spelled North Point, is a major port city of High Rock on its most northern coastline. It was founded in the 9th century of the First Era to capitalize on the location along trade routes in the area, and its fortunes have been tied to coastal commerce ever since. The location of Northpoint was first identified for settlement by the Breton trader Captain Yric Flowdys. Its deep waters made it accessible to large ships and it occupied a key location along regional trade routes. The most favorable position for the first pier was the area called Northpoint at the time, and so the new town adopted the name for itself. Captain Flowdys also made his own seat of power in the heights of nearby Dore Elard, and as the port rose to prominence, adapted the mountain's name to found the noble House Dorell. The Dorells actively managed Northpoint and the surrounding areas, leasing land to farmers and establishing solid trade relationships with Solitude. This entrepreneurial attitude brought increased wealth and prosperity to the citizens of Northpoint, not least themselves. They were granted a barony by Empress Hestra when High Rock became part of the First Empire, and even ruled over Shornhelm for a time. 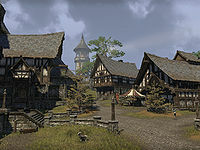 House Dorell has historically been one of the three prominent noble houses which contentiously vie for rule in Rivenspire, along with Houses Tamrith and Montclair. As Dorell's seat, Northpoint has occasionally suffered collateral damage in these political struggles, even being forcibly occupied by the Montclairs in 2E 582. This page was last modified on 21 October 2018, at 07:38.